I’m back, and I hope you’re not all “New Year, New You”-ed out, because I’ve still got New Year’s on the brain. Don’t worry, I won’t talk about resolutions. I want to talk about luck. December 31st is almost inevitably a day of regrets: most of us are proud of some accomplishments and pleased with how some things worked out, but less thrilled about others. It’s a lucky person indeed who can look back at an entire year with approval. I, for example, am happy I started and kept up a blog, but I wish I’d written more fiction. I did some fun stuff, including in the celiac community, but I ought to have taken advantage of more of the cultural opportunities New York has to offer. I’m glad I got celiac figured out, but I probably should have made time to go to the dentist. You get the idea. January 1st is a day to put behind us all the failures and disappointments of the previous year, and, perhaps, the previous night. New Year’s Eve is among the most hyped holidays of the year, but I find it’s usually a letdown. Not pictured: the bubbly, which is gone. By the way, if you like trivia, the reason the Angostura label is too big for the bottle is explained here. This year, it started off well with “classic champagne cocktails” (sugar cubes, Angostura bitters, and lots of bubbly) at a friend’s home, but it ended at a “warehouse party” in Brooklyn that got shut down by the fire department at 11:37 (cruel), watching the ball drop on TV in a random bar, and leaving just past midnight to trek home on the train with only Butterfingers for consolation. After that, I was more ready than ever for my customary New Year’s Day celebration. I’m honestly not a superstitious person, despite my love of astrology. But a few years ago, I discovered a list of foods considered lucky to eat on New Year’s Day in various cultures. Though I didn’t grow up eating lucky foods on New Year’s Day, I’m a “make new traditions but keep the old” kind of girl, so I decided to pick up the custom. grapes and pineapple for dessert, because we got lazy, and because grapes are eaten for luck at midnight in Spain. Plus, pineapple is gold, like cornbread, and money. We were a bit unlucky with how long the rice took to cook (I still don’t understand why), and our grapes were a bit sour, which apparently is a bad sign. But the meal, though delayed, was overall delicious. I felt lucky to have plenty of food to cook and share, and good friends with whom to enjoy it. Will it bring us luck for the rest of the year? Maybe. One last good omen is to have leftovers of your Hoppin’ John, which then gets called Skippin’ Jenny. Don’t ask me why—no one even knows why it’s called Hoppin’ John. Leftovers demonstrate frugality, which is sure to increase prosperity (according to tradition, if not to some economists). Sprue Jr. and I just yesterday polished off the last of the Skippin’ Jenny, so we must be pretty lucky. 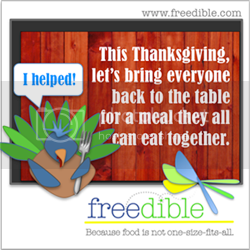 But, we purposefully made more food than we could eat, in order to have leftovers. So if anything, we made that luck for ourselves. Not pictured: the pot of Hoppin’ John, which my food photography talents are not equal to portraying in a decent way. I felt unlucky after my party was a bust, with not so much as a refund of the tickets (thanks, Rubulad). But the night might’ve gone better if I’d settled my plans sooner and nabbed tickets to a different, quickly sold-out, event—or if I’d bounced back more quickly after the party’s premature demise. Sure, bad things will always happen. But by adjusting plans and perspectives, we can bring ourselves more of the good stuff. It’s too late now to cook a New Year’s Day meal for 2014 (though you should try Hoppin’ John anyway, if you never have), but you can still make sure you have a lucky year. If you’re gluten-free, for example, you can choose wisely when you go out to eat or shop to avoid unlucky glutenings. In any area of life, putting in some effort and putting on a smile might bring us all the luck we need. So, a little belatedly, here’s to 2014. May it bring you good luck, good food, and good times—and may you help make darn sure it does. Do you agree that we make our own luck? Do you celebrate New Year’s Day or Eve with traditional foods? And did you make any resolutions this year?